Wild bears have recently been making headlines – especially in America. People are being left with nothing to do but stay away and document the invasion in awe as bears take possession of their property. In the Smoky Mountains in Tennessee, honeymooners had to stand and watch as a bear casually strolled around a hotel parking lot. The animal eventually decided that a Chevrolet car suited him best. Ignoring the man's orders to "get out of there," the big brown bear easily opened the car's front door and climbed in. The mischievous furry car-napper then got behind the wheel and sounded the horn. Not too pleased with the din, the bear jumped out and went to look for another car. Meanwhile in New Jersey on Monday, a 230 lb (more than 100 kg) male bear had a public park in Morristown all to himself, playing by the fountain and climbing trees before finally choosing to have a good rest in the people's recreation area. With the public beginning to gather around, officials had to seal off the park for the animal. The bear then received VIP transportation into the wild. After a safety net was placed around the tree where it had been resting, a wildlife official was called in to tranquilize it, and the huge park-goer was brought down by a fire truck. This famous guy is making World News tonight and Good Morning America!!!! Although bears' frequent intrusions into areas intended for humans are explained by the fact that they are most hungry at this time of the year, it seems that the animals are looking for circuses rather than bread alone. Bears appear to be particularly fond of playgrounds. Last week in Massachusetts, a bear was found rolling around playing with hay amid children’s toys in one woman's backyard. The big animal gnawed on her grandson's inflatable pool and rubber ball, she said. Recently, a whole bear family wandered in to a private property near Washington Borough in Warren County, New Jersey. 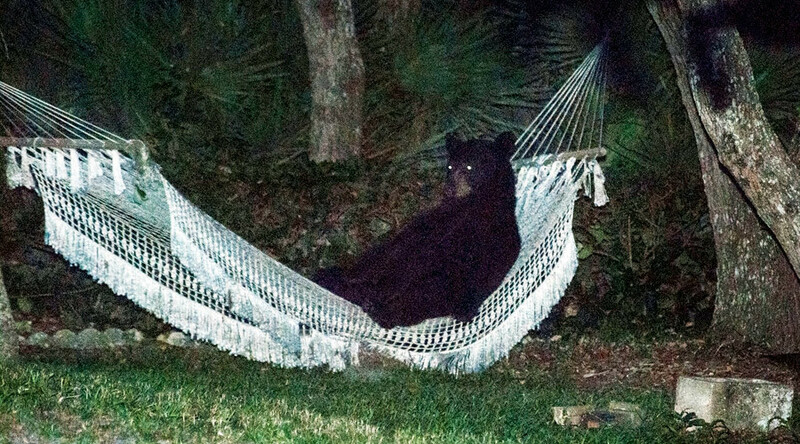 The mother bear and her two cubs were attracted by a nice comfortable hammock hanging in the yard. While the cubs desperately tried to handle the dangling hammock, their furry mom watched and helped one of them climb on to it to relax. In Alaska, a black bear decided he could make better use of a traveler's kayak. While the woman tried to scare the animal away with pepper spray, it took interest in her boat. Ignoring all pleas and reassurances that kayak "is not even food and it doesn't even taste good," the bear didn't stop gnawing on the plastic boat – seemingly doing so rather to annoy the hysterical human rather than to obtain a meal of any nutritional value. READ MORE: Alaska bear encounter: "Thanks for not eating my kayak... hey, stop, it's not even food!" Meanwhile in Russia, a brown bear was indeed looking for food when it broke into a house in Kamchatka in the Far East. While the owners were out, the animal helped itself to everything it could find in the kitchen, which led to a real Winnie-the-Pooh situation. The bear's bottom was a little too fat to fit through a window it wanted to escape through. Quite awkwardly, the animal got stuck, with its head on the outside, and paws still dangling inside. Back in the US, a black bear on the Michigan-Indiana border has become such an frequent area guest that he even got a special Twitter account. The animal "has been more visible than a presidential candidate in Iowa," the Detroit News wrote, adding that the first bear in Indiana in 144 years has been spotted 55 times in four months, peeking into windows, pounding on doors and "leaving muddy paw prints all over the place."